17 years of military service including two combat tours in Iraq, left me with many physical and psychological wounds. Three fractured vertebrae, traumatic brain injury (TBI), hearing loss, chronic bilateral leg pain, post traumatic stress disorder (PTSD) and irritable bowel syndrome are among the debilitating medical conditions I face each day. 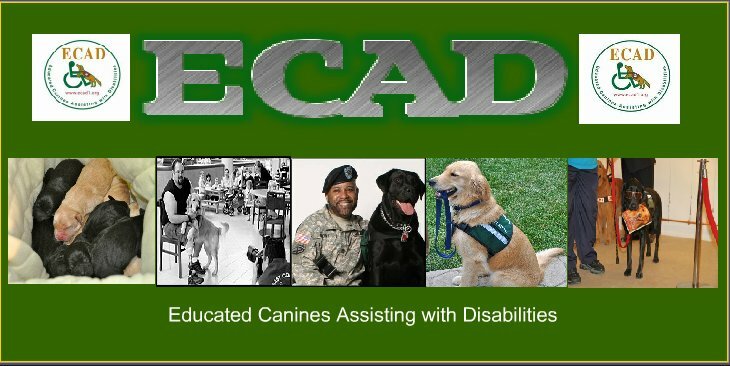 In November 2008, I had the great fortune of being introduced to East Coast Assistance Dogs (ECAD) and their new program for disabled veterans. Director and Master Trainer Lu Picard and her incredible team partnered me with Tuesday, a handsome 2-year-old golden retriever, fully trained as a service dog. Ever since, Tuesday and I have been inseparable. But Tuesday is no regular service dog. For not only is he the product of careful breeding and superb training, he is extraordinarily perceptive. This rare quality enables him to sense my needs as well as convey his. Tuesday helps me walk with balance – something trivial to many but difficult for me. He is able to retrieve virtually anything I need thereby alleviating much of the physical stress I had before. But Tuesday is more than just an animal that obeys commands. His sunny disposition brightens my days and calms my nights. 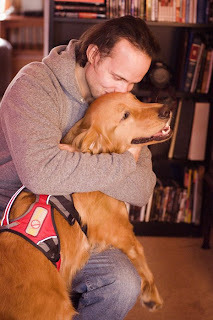 He sees me through the many terrible symptoms brought on by the effects of war -- PTSD and TBI. Heretofore, Tuesday has significantly changed the quality of my life. He reminds me to take many medications throughout the day at their proper intervals. He helps me to overcome social agoraphobia, hyper-vigilance and flashbacks that previously left me reclusive much of the time. His constant presence enables me to be more of who I used to be – a confident, vibrant and fun-loving person. Finally, Tuesday is helping me to love again. The dark memories of horrible things are not debilitating me the way they used to. The ghosts of war have given way to a place I once knew – a place where life was beautiful and all things were possible. This is why I am deeply grateful to Lu Picard, East Coast Assistance Dogs (ECAD) and the many people who helped bring Tuesday in to my life. Now that our lives are inextricably intertwined, I know that love and peace will remain everlasting.